As any voracious reader knows, there are so many books out there, it can be hard to choose just what to read next. So what could be better than a hand-picked recommendation from someone in the know? 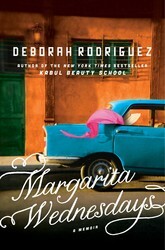 Every Wednesday the XOXOAD team likes to find out what some of its favorite authors are reading; today we’ve asked Deborah Rodriguez, author of MARGARITA WEDNESDAYS to tell us! 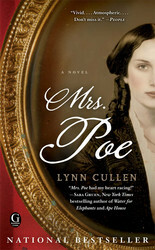 The amazing Mrs. Poe has everything I love in a book — romance, mystery, and my absolute favorite, historical fiction. The setting of this book is the dazzling world of New York in 1800’s. I was familiar with Edgar Allen Poe’s work, but I must say I had no idea about his personal life and the love triangle. I found it fascinating to enter one of the literary parties and see that Poe was a real rock star. I had no idea that his poem “The Raven” had elevated him into such a celebrity status within this world. I truly enjoyed the character of Frances Osgood — a.k.a. lover of Edgar Allen Poe. Mrs. Osgood, being a poet herself, had also had great success with her children’s story, “ Puss and Boots.” She was a single working mom with a deadbeat dad of a husband who walked out on her. She was just trying to make a living hawking her poems to feed her family. I found myself completely connected to Mrs. Osgood, and was always rooting for her to be successful in her writing ventures. I guess it’s the fellow female writer thing going on. I cant even imagine how hard it must have been for her at this time when women didn’t have equal rights, but she was so strong and independent and doing her best to keep up her social status, with a philandering husband, trying to juggle work and kids and all the while trying to make a living selling her writing. Then along came Poe, who she finds exciting, dark, intriguing and complicated — not to mention he has a wife — and the love affair begins. Don’t we all like those bad boys? Now, the wife Mrs. Poe just puzzled me. I didn’t know if I should feel sorry for her or not trust her. Poe married his cousin Virginia at her ripe old age of 13, it seemed to me she was an innocent but I do believe there is more to Virginia than meets the eye. I really enjoyed Mrs. Poe, but like I said before I love fictional history. Mrs. Poe checked all the boxes for me. I love to be entertained, and educated without even knowing it. I have been preparing for the launch of my new book Margarita Wednesdays, and getting ready for my book tour. I could feel myself getting nervous for the launch, and worse yet crazy worrying about what to wear on the book tour. So, each night I would curl up with Mrs. Poe and the wonderful authors of the 1800’s and worry about their books, and not mine. Lynn Cullen, your research was out of this world and your story telling is just fantastic. Now that I finished Mrs. Poe I must get back to Margarita Wednesdays‘ book tour, and my fashion crisis. In answer to the question of what happened following her New York Times bestseller Kabul Beauty School, Deborah Rodriquez is back with a new memoir.Irreverent, insightful, and blatantly honest, Deborah takes us along on her inspiring journey of self-discovery and renewal after she is forced to flee Afghanistan in 2007. She first lands in California, where she feels like a misfit teetering on the brink of sanity. Where was that fearless redhead who stared danger in the face back in Kabul? After being advised to commune with glowworms and sit in contemplation for one year, Rodriguez finally packs her life and her cat into her Mini Cooper and moves to a seaside town in Mexico. Despite having no plan, no friends, and no Spanish, a determined Rodriguez soon finds herself swept up in a world where the music never stops and a new life can begin. Her adventures and misadventures among the expats and locals help lead the way to new love, new family, and a new sense of herself. In the magic of Mexico, she finds the hairdresser within, and builds the life she never knew was possible;a life on her own terms.